Habitat’s Home Builders Blitz is a partnership between Habitat affiliates and the building community to build and renovate homes across the United States, helping to fulfill Habitat’s vision of “a world where everyone has a decent place to live.” This type of build began in 2002 in Wake Forest, NC and since then has resulted in more than 1,000 safe, affordable homes across the country. Builders and Habitat affiliates work closely to organize all aspects of building, including securing subcontractors and suppliers, fundraising and seeking donations of materials. Habitat Williamson-Maury’s 2019 Home Builders Blitz will be completed by local homebuilders, contractors, and volunteers. We are excited to welcome the Childress Family to our homeownership program. Kent and Gena Childress, both natives of Mississippi, have experienced many trials over the past few years. Kent, a former police officer who served in Mississippi and with the Williamson County Sheriff’s Department, was injured in the line of duty. “I injured my back making an arrest, and it has never been the same.” Then, three years ago Gena, a retired teacher, was diagnosed with multiple sclerosis. Today both Kent and Gena get by on social security disability due to their health challenges. 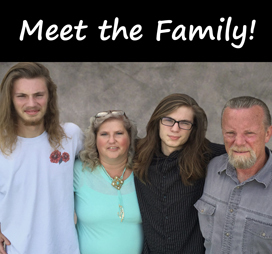 Learn more about the Childress family. Thank you to our 2019 Home Builders Blitz Sponsors! HCA – Physician Services Group, American Heating and Cooling, Apcom, Atlas Concorde, BugOut Termite & Pest Control, Central Woodwork, Cree Products, Ferguson Enterprises, Flow Construction, GAF, Hunter Douglas, Huskey Truss and Building Supply, John Maher Builders, The Jones Company, Lee Company, McCann & Hubbard, Metro Carpets, Moffett-Revell, Nashville Plywood, Inc., Professional Roofers, Real Green Solutions, Riverbend Nurseries, Rogers Group, SEI, Square D, 31-W Insulation, Twice Daily, Valspar, The Whirlpool Corporation, Willow Branch Outdoor Living, and Wilsonart International. Interested in being a Home Builders Blitz sponsor?Please contact Kim Randell at 615-550-5616.